Hey vinyl lovers! My buddy from HEAVY ROTATION RECORDS has finally opened his eBay shopfront. He specialises in black music, and sells only 100% Original Pressings, with no wack bootlegs or re-issues. It's been a long time coming but believe me it's been worth the wait. 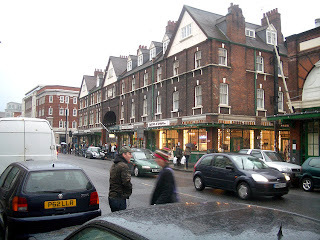 Vinyl fiends and beat diggers in the London area will know Ritchie from his bi-weekly stall at the Spitalfields Market Record Fair (photo above) near Liverpool Street Train Station. Over the years he has supplied me with some RAER pieces from my collection. My copies of MAIN SOURCE - "Think/Atom" (ACTUAL) and MC GLAMOROUS - "Good To Go" (PRISM) both came from the Heavy Rotation stock (thanks Ritchie). If it's a rare piece you are looking for then Ritchie can probably help you, or know a man who can. Take a peep at his store here. Over the next few weeks HEAVY ROTATION will be adding more crazy dope records to their online stocklist stretching across all genres from Jazz to Funk, Breaks to Soul, Hip Hop to Afro, Reggae to Latin - the crates run DEEP! Right now there some rare UK and US hip hop records up for grabs. There's even a copy of the UK holy grail FRESHSKI & MO ROCK - "Talking Pays" 12" on Tuff Groove. Now that's what I'm talkin' about!! That wasn't an easy record to find back in the day, let alone now. This is just the tip of the iceberg - there's more to be added on a weekly basis, so add HEAVY ROTATION to your favourite sellers list. If there is something particular you are searching for you can e-mail him your WANTS LIST to info@heavyrotationrecords.com. Just because it isn't in the shop doesn't mean he doesn't have one. With over 20 years experience of selling original wax he certainly "knows his onions!" Best of luck with your shop Ritchie!